With Valentine’s Day just around the corner and America’s sweethearts planning to spend an average of $143.56 each on the occasion, the personal-finance website WalletHub today released its report on 2018’s Best Places for Valentine’s Day along with interesting stats about the holiday in its Valentine’s Day Facts infographic. To determine the most romantic yet affordable cities for celebrating the Day of Hearts, WalletHub compared 100 of the largest U.S. cities across 23 key metrics, ranging from florists per capita to forecasted precipitation to cost of a three-course meal for two. $19.6B: Total Valentine’s Day spending projected for 2018 ($143.56 per person celebrating). $191 vs. $99: Men plan to spend nearly twice as much as women, on average, for Valentine’s Day 2018. $8.5 Billion: Amount Americans will spend on jewelry ($4.7B), flowers ($2B) and candy ($1.8B). 9 Million: Number of marriage proposals made each Valentine’s Day. MORRO BAY, Calif.– Romance abounds all year long in Morro Bay with glorious sunsets and fresh local oysters at the ready. Valentine’s Day and the extended President’s Day weekend are ideal times to plan a romantic getaway, and if you want to save a few clams, Budget Travel just listed Morro Bay, CA as one of the top 10 world-class places to visit in 2018 that won’t break the bank. Rock your arrival with the ever-stunning Morro Rock. Enjoy lunch on the Bay before checking in to your room with a romantic view. These winter lodging specialsare ready for romance. Enjoy a romantic dinner at Windows on the Water, a local favorite for romance. Late night fun for two with live music at the newly opened Siren Bar. Day 2: Outdoor Adventure for Two (or more)! A delicious bayside breakfast came be found on the patio at Blue Skye Bistro, overlooking the bay. The menu includes magnificent mimosas for those mesmerizing moments. Enjoy a fun-filled morning on your kayak and lunch adventure. Paddle through the waters of Morro Bay and its 800-acre wetland and stop for a romantic picnic on the sand spit. Enjoy a delectable dinner and sunset. Consider a warm-hearted waterfront dinner at the Galley Seafood Grill & Bar. After a lovely breakfast on the Embarcadero, set out on a winsome Whale Watching tour. The central coast is home to hundreds of humpback whales feeding on abundant sea life in the fall and winter months. Morro Bay makes it easy for cyclers to get around town with bike trails and a harbor front pathway winding past families of sea otters, out to the rock and down to the beach. End the day with a passionate meal at the Thai Bounty, featuring authentic Thai BBQ, seafood and cuisine. Day 4: Parting is such Sweet Sorrow! Say Au revoir and grab a coffee and breakfast from La Parisienne Bakery– one of the best “finds” in Morro Bay. Make it a historic goodbye by stopping at the interactive Museum of Natural History,located in Morro Bay State Park. Savor your final Bon Voyage Lunch at the Marina at Bayside Café. For the full itinerary, click here. Couples can also find their own secluded beach in Montano De Oro State Park, or visit Hearst Castle just 30 minutes north of Morro Bay. Come find your romance in Morro Bay now, and all year long. For additional information on hotels offering winter midweek rates from $55 and weekend rates from under $100, check out booking engine here. For information on exciting things to do and see in Morro Bay, visit www.morrobay.org. The new National Geographic Society book, The World’s Most Romantic Destinations, names Jade Mountain as the recommended hotel for the island of Saint Lucia, one of the 50 featured locales. The resort is known for its intimate weddings, and its Celestial Terrace, one of the most popular locations, was used twice as the Final Red Rose Proposal in ABC’s The Bachelor. The hotel even employs a Romance Concierge to help with proposals, surprise gifts and other memorable moments during honeymoons and anniversaries. Jade Mountain is set on a lush, scenic 600-acre estate overlooking the Gros and Petit Pitons, 2,500-foot twin volcanoes that have come to symbolize St. Lucia and are a UNESCO World Heritage Site. The resort’s cuisine, which the book deemed “exquisite,” is overseen by the highly acclaimed chef Allen Susser, who conceived the groundbreaking Miami restaurant Chef Allen’s and has won the James Beard Foundation’s Best Southeast Chef award. Architect and owner Nick Troubetzkoy’s story began in the 1970s, when he opened Anse Chastanet, Jade Mountain’s sister property, as a pioneering eco-conscious hotel. In 2007, after many years of planning and construction, Troubetzkoy opened his labor of love: Jade Mountain, an intimate, luxurious resort at the top half of the property. With their incredible panoramas, massive infinity pools that seem to float over the Caribbean and handcrafted furnishings sourced from local materials, each room is a majestic, sweeping space that’s a true work of art. These sanctuaries provide an unforgettable stage set for the wedding, honeymoon or anniversary of a lifetime. For reservations, call 800-223-1108 or contact Jade Mountain at 1-758-459-7000, e-mail jademountain@ansechastanet.com, www.jademountain.com. With Valentine’s Day around the corner, many have romance on the mind. If you are looking to rekindle old flames or charm your significant other with something extraordinary, consider these romantic retreats. From “glamping” in Wyoming to touring France by bike, here are 10 adventures that will make capture your hearts. Consider gifting the romantic trip for a future date, with so much to look forward to. Bike Across France – Ride & Seek has introduced a romantic cycling tour in the Provence region of France highlighting some of the most beautiful villages as ordained by the group Les Plus Beaux Villages de France. Guests will visit a number of classic destinations such as St Remy de Provence and the Vaucluse. From Venasque to Les Alpilles to Glanum, this is a dreamy tour of Provence. Rocky Mountain Glamping – Hike, ride horses, fly fish, snowmobile, x-country ski, and play cowboy at the 25,000 acre Red Reflet Ranch in Wyoming. The ranch is both working ranch and luxury resort. Gourmet dining offers ingredients from the ranch’s butcher shop, organic greenhouse and gardens. From cattle drives to branding, the true western lifestyle thrives at Red Reflet. Robinson Caruso Island Retreat – Retreat to the mystical Chilean island where marooned explorer Robinson Crusoe once lived. Hear the legends of pirates and treasure as you hike through deep forested ravines, cascading streams, and along jagged coastlines in this World Heritage Biosphere Reserve. Enjoy active excursions such as snorkeling, hiking, diving, horseback riding, and fishing, by day. Return to the comfort of your Robinson Crusoe Island resort by night. New Zealand Food & Wine Adventure – On this exclusive luxury food and wine tour hosted by Frontiers International Travel President, Mike Fitzgerald, guests will experience New Zealand’s charming mixture of refined lifestyle and adventure. Discerning travelers will visit some of the most scenic coastal and inland areas of New Zealand, while enjoying a variety of outdoor activities, fine dining, and world-class wine. Trek with Gorillas in Rwanda – Encounter some of the last remaining mountain gorillas in the world on a Gondwana EcoTours trek into the lush forests of Rwanda. Intrepid travelers will also track chimpanzees and the golden monkey, and likely come across elephants and African buffalo. Après-Ski Retreat in Montana – Rent a luxurious cabin at the Moonlight Basin community in Big Sky, Montana and find active pursuits paired with food and drinks. Ski beautiful terrain that isn’t open to the public, sample hors d’oeuvres and après-ski drinks by a campfire, snowshoe to the clubhouse by starlight, and then sit down for an exquisite wine-paired dinner. Wine Cruise on the Douro River – On this romantic cruise with Adventure Life, guests will visit a fairytale castle from Portugal’s Romantic period, dine with breathtaking views from a 14th century monastery, take in art from the 12th century to modern times, and taste plenty of wine – including at a family-run estate and a terraced vineyard. See the Northern Lights in Iceland – Big Chill Adventures offers an opportunity to explore the southern part of Iceland, known for its glaciers, icebergs and black sand beaches. Highlights include dogsledding, trekking glaciers, snowmobiling, spelunking, and soaking in geothermal hot springs. Discover the Silk Road and Tibet – Explore the Tibetan Plateau on a splendid circular route that embraces the sacred cities of Tsetang, Lhasa, Gyantse and Shigatse. Ride the high-altitude train from Lhasa down to Lanzhou, and onto Western China and the Kashgar Animal Market. Along the way, visit Dunhuang’s UNESCO-listed Mogao Caves and Turpan’s lush Grape Valley. DELRAY BEACH, Fla.– The Red Carnation Hotel Collection offers the perfect romantic rendezvous for lovers around the world. Rekindle passion in London, discover the true meaning of romance in Dorset, create unforgettable memories in Guernsey or Geneva. Florida’s tropical Palm Beach is ideal for a beachside escape, while South Africa’s stunning scenery boasts a multitude of indulgent activities. Every Red Carnation hotel sets the scene for tender romance – rose petals and candles, Champagne, chocolate-covered strawberries, delectable dining and exquisite turndown surprises – each capturing a unique Valentine’s Day experience. The Red Carnation Hotel Collection has additional luxurious packages to ensure your Valentine’s Day getaway is one to remember. For more information about The Red Carnation Hotel Collection, visit www.redcarnation.com. From the mountains of Vermont and cultural hub of Massachusetts to the canals of Amsterdam, what could be more romantic than surprising your special someone with a last-minute Valentine’s Day escape? For couples still looking for a special Valentine’s Day getaway, the Inn at Manchester’s Fireside Romance package helps set the mood for a romantic winter escape. Lovebirds can sip on cocktails in the Inn’s cozy living room-style pub, discover the peaceful charm of Southern Vermont, and relax by their own private fireplace. Available through March 31, 2017 based on availability, the Fireside Romance package includes: two nights’ accommodations in a room with a fireplace; full breakfast daily; Vermont chocolate and a bottle of wine upon arrival. Prices start at $255 per night in a suite, based on double occupancy. Valid on new reservations only. Call 802-362-1793 to book. The Inn at Manchester is located at 3967 Main Street, Manchester, VT. For more information, visit www.innatmanchester.com. Red Lion Inn, Stockbridge, MA: Red Lion Inn’s warm lobby fireplace has been welcoming travelers since 1773, and this winter will welcome couples looking to rekindle the romance. The inn’s Date Night package includes overnight accommodations, a $50 dining voucher, a bottle of wine and a box of locally-made chocolates. Rates start at $210 Monday-Sunday and $280 Friday and Saturday based on double occupancy. Available until May 25, 2017. To book, visit www.redlioninn.com. Porches Inn at MASS MoCA, North Adam, MA: Guests can discover of the art of romance at the Porches Inn at MASS MoCA. The Date Night Package includes accommodations, two tickets to MASS MoCA, and a three-course dinner for two at the Gramercy Bistro, Pera Mediterranean Bistro or The Williams Inn restaurant. Rates start at $287 per night Sunday – Thursday and $337 per night on Friday and Saturday based on double occupancy. Available through May 18, 2017. To book, visit www.porches.com. For couples looking to take their romance international, The Dylan, the refined luxury boutique hotel centrally located in Amsterdam’s trendy “nine streets” shopping area, welcomes couples with sweet poetry. On February 14, Amsterdam’s Poetry Pusher will create personalized poems for couples on an old fashioned typewriter based on each couples interests and likes. Available February 11-19, 2017, The Dylan’s Valentine Package features, one overnight stay; Dylan buffet breakfast; the hotel’s signature High Wine experience; a special Valentine gift and poem created by the “Poetry Pusher” (customized poem for guests staying on February 14 only, guests visiting other nights will receive special Dylan Poem crafted by the Poetry Pusher). Rates start at €405 (approximately $431 USD) per package, based on a double room for two people. Additional nights are available starting at €400 per night including breakfast. Package is subject to available and excludes 5% city tax. To book, visit www.dylanamsterdam.com. The Date Night packages are available throughout the winter, blackout dates may apply; taxes and gratuities additional. 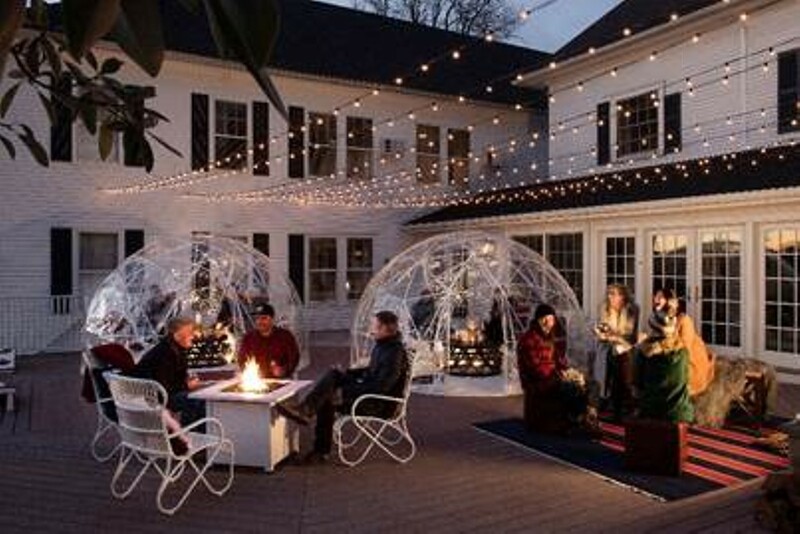 KENNEBUNKPORT, ME – This February, the Kennebunks transform into a romantic retreat for lovebirds. “New England’s Most Romantic Town” will once again roll out the red carpet inviting couples to rendezvous during the month-long Paint the Town Red festivities. Dock Square in downtown Kennebunkport will be decked out in red twinkly lights, while restaurants, hotels, galleries and shops in the area welcome sweethearts with a calendar of special events, romance hotel packages, red plate dining specials, and red tag sales from retailers. Paint the Town Red celebrations continue all month long with special dinners and culinary experiences, mixology classes, wine tastings and more. A full list of events can be found at www.lovethekennebunks.com.  Kennebunkport Resort Collection: The “Love KPT” lodging package includes a two-night stay for two people at The Boathouse Waterfront Hotel (starting at $373) or the Kennebunkport Inn (starting at $405), arrival goodies of red wine and chocolate-covered strawberries, a three course dinner for two, and a late check-out at noon. The package is available from now through March 30, 2017. To book, visit the individual property’s website. To help curate the perfect romantic getaway, couples can call upon Kennebunkport Resort Collection’s (KRC) Cupid Concierge, Tasha Harper. Services include creating customized music playlists for the room, delivering flowers, scheduling couple’s massages and arranging late check-out, dessert in bed, and much more. The Cupid Concierge can be reached at cupid@lovekpt.com or 207-967-1517.  Captain Fairfield Inn: the Romance Package includes an artisan cheese and meat board, a bottle of wine, and a single red rose; the package can be added to bookings for $75; rates start at $159 per night.  Breakwater Inn & Spa: Romance Package includes hand-made sweet treat from the property’s chef, sparkling water, and seasonal flower bouquet. Available February 1-28, 2017, rates start at$204 per night, plus 9% occupancy. Blackout dates may apply, based on availability. To book call 207-967-5333.  The Kennebunk Inn: the full service inn and restaurant located in the heart of Kennebunk is offering a discounted weekend package rate on February 10 and 11, 2017 for two-nights (price excludes tax). Rooms: Adams $160, Jefferson $180, and Madison Suite $200.  King’s Port Inn: mention LoveKPT when making the hotel reservation and receive a free gift upon arrival. To book, call 207-967-4340.  Captain Lord Mansion: the “February is for Lovers” package includes reduced mid-week rates, romantic third night free package, split of sparkling wine, chocolate-covered popcorn and frequent visitor credits. The third night free package is not valid February 17 through 20, 2017 and cannot be combined with any other coupon, discount or third party gift certificate. Rates start at $199 per night. Local restaurants will feature Red Plate Specials ranging from specially priced bottles of champagne and three-course dinners with wine, to pizza making. Red Tag Savings will also be offered throughout the month at participating shops, attractions and spas, ranging from 50% off all items to complimentary admission. For full details and list of participating restaurants, shops, spas and attractions, visit: www.lovethekennebunks.com. Paint the Town Red deals and events are available from January 27 through February 28, 2017. All details, restrictions, and booking instructions – as well as a complete list of events and specials – can be found at www.lovethekennebunks.com. Consumers can follow the love on social media using #lovethekennebunks.